Oatmeal is the only whole grain food recognized by the FDA to lower cholesterol and reduce the risk of heart disease. Unfortunately, oatmeal is often considered a boring breakfast. When placed next to a stack of pancakes or an omelet, oatmeal looks like a bowl of lifeless mush. It's not until it's in your mouth that you think, "This is pretty good. I should eat it more often." With Magicolor Oatmeal, Quaker takes a shot at making oatmeal more interesting. The attempt alone is worth a couple Golden Eggs (our rating scale). But unfortunately, Magicolor makes oatmeal more interesting the same way that a plush toilet seat cover makes going to the bathroom more interesting... increase in interest minimal. The gimmick is that colors "magically appear" in your oatmeal when you add hot water to the dry oats. It works. It's kind of cool. But the number or colored specks in this breakfast are far and few between. Think of a rainbow. Now think of a time when you noticed a colored spec on your arm and worried you had a skin disease. There is very little color in a bowl of Magicolor Oatmeal. This oatmeal promises something else - a "crunchy punch" that makes "lots of colorful noise". This is a great overstatement. Each box of this new oatmeal comes with six familiar instant oatmeal packets and six tiny clear packets that contain what amounts to very plain granola. I love the idea of making oatmeal more interesting by adding "crunch", but two borings do not equal excitement. The granola clusters aren't particularly tasty nor do they have all that much crunch. In fact, if you let the clusters set more than a minute in the oatmeal, there is no crunch at all. The cinnamon flavor is nothing new and will remind you of instant oatmeal without the promise of magic. You may even be disappointed after the build up from the box with colorful flying stars and the word "CRUNCH" in huge letters. You have to give Quaker credit for trying to breathe new life into oatmeal. 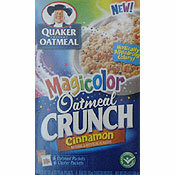 But, isn't there anyone at Quaker with the nerve to say, "Magicolor Oatmeal Crunch needs more color, crunch and flavor." I'm giving them a moderate rating for trying to liven up an important breakfast option. Next time, I hope they try harder. 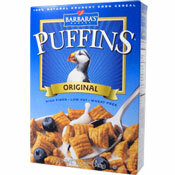 Price reflects one box (six servings) purchased during two for $5.00 sale. What do you think of Magicolor Oatmeal Crunch - Cinnamon? Why not eat granola instead? Flavor+crunch+oats. Is it equal to oatmeal (porridge, as my mom called it) for cholesterol benefits? So far my research hasn't told me. Does Mr. Breakfast know? But soft! What light through yonder window breakfast? It is the East, and oatmeal is the sun! for Magicolor Oatmeal Crunch is the stuff life is made of. Well, the answer to that, is Magicolor Oatmeal Crunch. OK - but at 4.99 a box - too much money. Okay i don't really like oatmeal but this is really good the colors make it entertaining and fun dare i say it to eat though it tastes like oats it's very good so i guess i'd buy it again but mainly because of the entertaining colors. I have tried the maple brown sugar flavor of Quaker Oatmeal Crunch and I have to say that I was disappointed. I thought that the crunchy granola would provide an interesting texture and would make my oatmeal a little more exciting. Unfortunately, the granola clusters weren't really even that crunchy. They just seemed stale and out of place in the creamy oatmeal. For the rest of the box I think I will just eat the clusters separately.